Joseph S. Fine is Of Counsel with the firm. For more than thirty years, he has represented unions and employees in arbitrations, mediations, and negotiations, and in litigation at the National Labor Relations Board ("NLRB") and before state and federal courts. Additionally, he counsels employees in the negotiation of employment and severance agreements. For more than twenty years he was a partner at Reitman Parsonnet in Newark, and then was Of Counsel to Livingston DiMarzio Baptista in Nutley. He began his career at Eisner and Levy, a labor firm in New York, and as staff counsel at District 65, United Automobile Workers ("UAW"). Mr. Fine has been AV® Preeminent™ Peer Review Rated — the highest rating in legal ability and ethical standards — by Martindale-Hubbell®. For a description of the selection methodology for Martindale-Hubbell, please click on the link. No aspect of this advertisement has been approved by the Supreme Court of New Jersey. Mr. Fine is a member of the Executive Committee of the New Jersey State Bar Association Labor and Employment Law Section and its Disability Rights Committee. Formerly, he was co-Chair of the Section’s NLRB Committee and of its Alternate Dispute Resolution Committee. 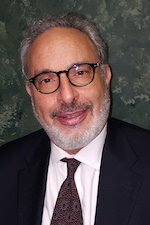 He is also a Master of the Sidney Reitman Labor and Employment American Inn of Court and a member of the New Jersey Association of Professional Mediators. He was an editor of How to Take a Case before the NLRB, published by the American Bar Association and the Bureau of National Affairs. He is a frequent speaker on labor and employment topics at programs sponsored by the Institute for Continuing Legal Education, by the New Jersey State Bar Association, and by the NLRB. He has been an adjunct professor of collective bargaining at Rutgers University, and a guest lecturer at colleges, law schools, and union apprenticeship programs. He is admitted to practice in New Jersey and New York, and before the United States District Courts for the District of New Jersey, the Southern District of New York, and the Third Circuit Court of Appeals. Mr. Fine is an honors graduate of Rutgers School of Law - Newark where he was the recipient of the G.A. Moore, Jr. Prize for distinguished work in equal opportunity law. He received his B.A. from Livingston College, Rutgers University. Clients rely on Rabner Baumgart Ben-Asher & Nirenberg, P.C. for the drive and perseverance its attorneys provide and the results they produce in employment discrimination, whistleblower retaliation, sexual harassment and other employment-related cases, as well as in its comprehensive representation of entrepreneurs and small businesses in corporate and commercial matters. From our office in Upper Montclair, we serve all of New Jersey and also represent clients employed in New York.